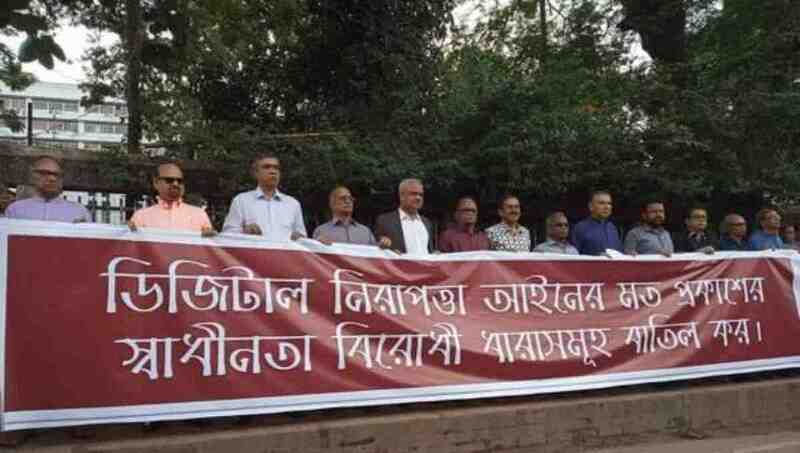 Dhaka, Oct 15 : The Editors’ Council formed a human chain in front of the Jatiya Press Club on Monday, demanding amendment to nine sections of the recently enacted Digital Security Act, 2018. Reading out a 7-point charter of demands at the human chain around 11:30 am, Mahfuz Anam, general secretary of the Editors’ Council and editor of The Daily Star, said the Digital Security Act will restrict the freedom of press and media. “We want the government to amend the law in the next session of parliament,” he said. Anam said the Editors’ Council is open to any discussion on amendment to the law. “But that discussion must be meaningful. We don’t want to see any farce in the name of discussion,” he said. Earlier the Editors’ Council announced the Human Chain programme at a press conference at the press club on Saturday, demanding amendment to sections 8, 21, 25, 28, 29, 31, 32, 43 and 53 of the act in the last session of the present parliament scheduled to begin on October 21. The council earlier called the human chain for September 29 but postponed it at the request of information minister Hasanul Haq Inu. The other demands include (2) the amendments (to 9 sections) be brought about in the last session of the present parliament; (3) in conducting search in any media institution by police or any other body, and they should only be permitted to block specific content but not to shut down any computer system, and in blocking content, they should do so only after discussions with the editor with reasonable proof of why such content should be blocked. The demands also include (4) in blocking or confiscating any computer system of a media house, prior order from the High Court must be obtained; and (5) in cases of offences relating to performance of journalistic duty by media professionals, they must be issued summons to appear before a court (as is the law now), and under no circumstances should media professionals be detained or arrested without warrant and due process of law. The two remaining demands are (6) in instances of offences made by media professionals, it should be routed through the Press Council to establish prima facie case. For this purpose, the press council may be strengthened appropriately; and (7) the primacy of the Right to Information Act, passed by this government, should be unequivocally established above the Digital Security Act, and all freedom and rights granted under that law to citizens and the media must be protected. Prothom Alo Editor Matiur Rahman, New Age Editor Nurul Kabir, Kaler Kantha Editor Imdadul Haque Milon, Bangladesh Protidin Editor Nayeem Nizam, Manob Zamin Editor Matiur Rahman Chowdhury, Naya Diganta Editor Alamgir Mahiuddin, Dhaka Tribune Editor Zafar Sobhan, Financial Express acting Editor Shahiduzzaman Khan, Independent Editor Shamsur Rahman, Sangbad acting Editor Khandker Moniruzzaman, Inquilab Editor AMM Bahauddin, Banik Barta Editor Dewan Mohammad Hanif, Samakal acting Editor Mostafiz Shafi and Jugantor acting Editor Saiful Islam, among others, joined human chain. The much-talked- about ‘Digital Security Bill, 2018′ was passed in Parliament on September 19 and President Abdul Hamid assented to the Bill making it a law on October 8.